We’d love your help. 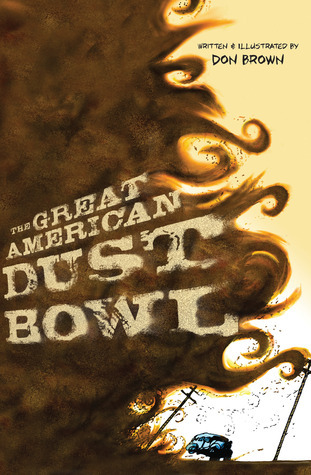 Let us know what’s wrong with this preview of The Great American Dust Bowl by Don Brown. A speck of dust is a tiny thing. In fact, five of them could fit into the period at the end of this sentence. On a clear, warm Sunday, April 14, 1935, a wild wind whipped up millions upon millions of these specks of dust to form a duster—a savage storm—on America's high southern plains. The sky turned black, sand-filled winds scoured the paint off houses and cars, trains der A speck of dust is a tiny thing. In fact, five of them could fit into the period at the end of this sentence. The sky turned black, sand-filled winds scoured the paint off houses and cars, trains derailed, and electricity coursed through the air. Sand and dirt fell like snow—people got lost in the gloom and suffocated . . . and that was just the beginning. To ask other readers questions about The Great American Dust Bowl, please sign up. Clara Yes. It is somewhat good. This is a short, quick, easy read, a history lesson in the most attractive packaging imaginable. Brown's text is simply presented, but thoroughly researched. I loved that he had the scientific explanations for the dust storms as well as first hand accounts. And I was delighted to see that he did cite his sources at the end. I don't always see this in adult nonfiction, much less a middle grade graphic novel. But the art is going to be the star for most readers, including me. The cover is absolute This is a short, quick, easy read, a history lesson in the most attractive packaging imaginable. Brown's text is simply presented, but thoroughly researched. I loved that he had the scientific explanations for the dust storms as well as first hand accounts. And I was delighted to see that he did cite his sources at the end. I don't always see this in adult nonfiction, much less a middle grade graphic novel. But the art is going to be the star for most readers, including me. The cover is absolutely spectacular, and it's an accurate representation of what you'll find inside. It's beautiful and evocative, in sepia tones that are perfect for the time period (it just feels 1930s, which is probably the influence of The Wizard of Oz at work) and the subject. It looks and feels dusty, which is absolutely perfect. I always like to have a graphic at hand to read. Some go quickly and others are a slower read. Some are good verbally, some are well illustrated. It is nice to find one that is both. This book was well illustrated and colorful. It also gave a lot of historical fact wrapped up in it's few pages. This book tells of the 1930's Dust Bowl in America. Not the first dust storm to ever occur, but the period of time that seemed to hold the most dust storms, one after the other. How it effected the people, the air quality, the land, and the wildlife is addressed. A short book with a lasting history lesson. Concise, well-researched, and easy-to-understand, this excellent graphic novel captures the horrible devastation of the Dust Bow catastrophe. A must have for classroom and school libraries. The Great American Dust Bowl is about a very strange natural phenomenon that created a huge cloud of dust, and the people who have to put up with it. This book was great, I didn't even have any idea that Dusters could actually happen or to what extent! And the graphic novel format is a good way to teach simple history to people. Great nonfiction piece on what the dust bowl actually was. Brown talks about the environmental things that happened to make the world dusty, and talks in detail about the effects on the people living in the Midwest at the time. His illustrations, though often grim, are aesthetically pleasing, and clean and clear. Many take the form of infographics. He doesn't get down to personal stories, really. He's more focused on the more general experiences of people as a whole, and the macros of the situat Great nonfiction piece on what the dust bowl actually was. Brown talks about the environmental things that happened to make the world dusty, and talks in detail about the effects on the people living in the Midwest at the time. He doesn't get down to personal stories, really. He's more focused on the more general experiences of people as a whole, and the macros of the situation. And of course, it's a pretty grim tale. This is a brilliant graphic novel detailing the history of the Dust Bowl. I think I'll pair panels of it with passages from Out of the Dust. I see that it's just dust in the wind"
"The plain bordering the Rockies, despite its flatness, is still more than a thousand feet above sea level. It is a dry place: it receives no more than twenty inches of rain and snow a year, about half of what Georgia, Maine, or Oregon gets. "Bison found the grass. Herds grew until there were tens of millions of bison. "American Indians found the bison and made them the center of their culture, using them for food, clothing, and shelter. The Indians, the buffalo, the land, and the weather existed in a balance for more than a thousand years. "Pioneers from the settled, eastern United States came to the plains in the nineteenth century. By 1876, they had pushed the Indians into reservations and slaughtered millions of bison. Ranchers and cattle replaced the Indians and buffalo. "Ranchers were sure that the 'immensity of grass' that had supported the bison would sustain cattle. In the southern plains nearly eight hundred miles of barbed-wire fence penned in about 150,000 head of cattle. "But cattle lacked the sturdiness of bison, and the summer heat and winter blizzards wiped them out. "The ranchers' hard luck didn't darken their sales pitch when they decided to unload the land: farmers bought, somehow overlooking that the pledges of wealth came from the failed ranchers." Want the real dirt on the Dust Bowl? For more than a decade the quality of Don Brown's picture book nonfiction and biographies for children have made him someone whose new books I automatically and excitedly sit down to read whenever they come along. Brown's latest work, THE GREAT AMERICAN DUST BOWL, is no exception. As you can see (above), he is able in a couple of hundred words to provide a solid foundation for understanding the historical and geographic factors that would eventually lead up to the Dust Bowl and the terrible dust storm in 1935 that he portrays here in haunting images and interesting fact-filled text. "'I thought it was the last day of the world.'" Brown's narrative about the historic dust storm is so much more powerful because of his thorough researching which is documented in a Selected Bibliography and Source Notes. Brown's account of these dust storms focuses in large part on crazy weird facts that are so entertaining and ripe for sharing with friends. For instance, the fact that kids ended up with brown-colored snowmen. That ceilings in some houses collapsed "from the weight of dust that had gathered in the attic." That "birds and jackrabbits and tumbleweeds all ran in front of the storm." That the dust traveled to and fell upon Chicago, Atlanta, Boston, Washington, D.C., and New York City. These are the sort of fascinating facts that provide a real grasp of what it was like and how immense it was. "Men stood by their fences and looked at the ruined corn, drying fast now, only a little green showing though the film of dust." There are some amazing pieces of American literature that are set in the days of the Dust Bowl. Young readers who are turned onto Don Brown's eye-catching introduction to this historic disaster -- which stemmed from the missteps of man and the unforgivingness of nature --will be far more interested and prepared when it comes time to read OUT OF THE DUST or THE GRAPES OF WRATH. I’m always drawn to this story, the story of the American Great Depression. It shaped my dad and mom and my parents’ generation, forming habits of thrift and care amid desperate times of worry and despair. I couldn’t pass up this new graphic novel for older children. And I’m glad I didn’t. Great American Dust Bowl uses startling pictures and words to share the story of that bleak time. Excellent. A brilliant, dramatic, graphic chronicle of America's worst environmental catastrophe. A great little historical graphic about the dust bowl. Very informative... I probably got just as much out of these 80 pages as I did out of a whole book I read on the subject! Overview of the dust bowl. Whetted a thirst to consider taking time for The Worst Hard Times by Egan and Burns'/Duncan The Dust Bowl. It's so sad reading about these events and the effects they had on so many people. 1. Story plot is easy to follow, Don Brown uses flashback and revisits historically significant events leading up to the American Dust Bowl. I believe this will help students make connections to other events they may or may not have studied completely yet. However, if this graphic novel is being used in a classroom, the teacher may have to decide if these events are worthy of full studies. It is unfortunate the curricula do not align (at least in Lincoln) for this American History study with literature with our Social Studies standards. 8th grade is when students start American History while Dust Bowl literature is studied in 7th. I believe the panels are exceptional. I enjoyed the variety of formats that the illustrator used. 2. Application/Audience: English class, 7th grade. I picked this book from the shelf because of it’s connection to the curriculum. I think these would be a wonderful addition to the Out of Dust Bowl novel they already use. This visual rich text will help those below grade level students see what the prose is describing. I believe the language is frank and descriptive and not suitable for young students under 3rd grade. 3. I truly think the visual will do so much for the students in 7th grade, to really show them the hardships and struggles of this time period. I have always loved the Out of Dust Bowl prose and thought it was so descriptive. However after reading the article “Graphic Novels: The good, the bad, the ugly” and understanding the issue of truly struggling readers of seeing the idea being conveyed while trying to read word by word, I know that the low readers need more support in ‘seeing’ the meaning. I think this graphic novel will deliver. Don Brown's graphic novel, The Great American Dust Bowl does a fantastic job of laying out the facts about the time in our country's history when the Dust Bowl was at its worst. He lays the foundation for the events by explaining the geology of the region, dating back to the creation of the Rocky Mountains, along with the ecological effects on the region as first the Native Americans and later the settlers lived on the land. He also explains the economic and historical significance of this time and how it all contributed to the dust bowl. Brown's descriptions of what these "awe-inspiring" storms were like are not glossed-over in any way to allow for the fact that the audience is primarily children. Brown describes the terrible storms and their myriad effects with honesty. While the topic is serious, and the work Brown does to explain the "how" and "why" of the Dust Bowl is complicated, this book is in no way boring or off-putting. Brown's choice to make the book a graphic novel is really smart: the reader learns from the illustrations, the descriptions, and the words of the people of the time as they "speak" about their experiences. Visually the book is impressive. The print and illustrations are done in a palette of colors ranging from red through orange and yellow to every shade of brown. There's no green and very little blue to be found, and this emphasizes what the words in the text say. Brown even writes some of his text in swirls that mimic the rising, swirling dust. This is an excellent resource for learning about the various aspects of the Dust Bowl, but is also a great read to put into the hands of readers who enjoy informational texts. 1) This text is a nonfiction graphic novel about the events during the Dust Bowl. The plot is easy to follow and the panels are creatively illustrated. This would be a remarkable book to use for researching the topic. The story is easy to understand with the explanation of the changes in land preservation and developments from the ranching to farming of the soil. The larger pictures guide the reader to focus on issues of economy, erosion, effects on people and animals, and life during these diff 1) This text is a nonfiction graphic novel about the events during the Dust Bowl. The plot is easy to follow and the panels are creatively illustrated. This would be a remarkable book to use for researching the topic. The story is easy to understand with the explanation of the changes in land preservation and developments from the ranching to farming of the soil. The larger pictures guide the reader to focus on issues of economy, erosion, effects on people and animals, and life during these difficult times. 2) This novel would be great to use with a research of the 1930's, the Dust Bowl, changes in the land, or changes in farming. It has large pictures with great detailed information. I would suggest it for advanced third grade readers into the middle school levels. The information is presented in chronological order and the student could easily place steps on a timeline for study. Within the same line of graphic novels, I found a great nonfiction text with 24-hour history. This book was titles D-Day by Agnieszka Biskup. Heinemann Library puts out a whole collection of books about nonfiction events such as wars. It would be wonderful to have different students reading different parts of the collections to share with the class. This would also spark interest in the nonfiction materials. Like the Dust Bowl, it would be for advanced third through sixth grade students. If you were drawn in by the cover art, like I was, you will not be disappointed. The illustrations are just mesmerizing. It's not a story, it's a history lesson but the subject matter is riveting. The dust storms of the "dirty thirties" are the subject but Brown gives a nice, concise background of the U.S. Plains and how the environment plays a great, sometimes devastating, role in human lives. Some of Brown's sentences were confusing; they had a tendency to run on and use conjunctions that didn If you were drawn in by the cover art, like I was, you will not be disappointed. The illustrations are just mesmerizing. It's not a story, it's a history lesson but the subject matter is riveting. The dust storms of the "dirty thirties" are the subject but Brown gives a nice, concise background of the U.S. Plains and how the environment plays a great, sometimes devastating, role in human lives. There's nothing better than a book that in which you learn something or many somethings. This graphic novel taught me so much about the science behind dust storms and also the devastation that it cause that was not only to people and things, but the damage it cause to wildlife as well as tales about what would bring the rain, but like the recent book about the Irish famine that I read, I also didn't realize how long the dust storms lasted (nearly a decade) AND that they sometimes continue to kic There's nothing better than a book that in which you learn something or many somethings. This graphic novel taught me so much about the science behind dust storms and also the devastation that it cause that was not only to people and things, but the damage it cause to wildlife as well as tales about what would bring the rain, but like the recent book about the Irish famine that I read, I also didn't realize how long the dust storms lasted (nearly a decade) AND that they sometimes continue to kick up in the west still (with an image from Arizona from just a few years back). Exceptional accounting of a devastating event in our country's history. The graphic format makes it accessible to readers who might not be as willing to pick up a typical informational book on the subject. The back matter includes a thorough listing of source notes and selected bibliography. This would be paired well with Phelan's Storm in the Barn and Birney's Seven Wonders of Sassafras Springs. 4.5 stars. Great presentation of facts in a graphic novel format, excellent use of color and spacing. I love how the speech bubbles are actual quotes annotated in the back matter, very well researched. I learned a lot about this time period and area. Kids in Texas will be able to relate to the drought and dust storms, they sometimes even reach Dallas! I said WOW when I got to the end and turned the page to the actual photos of the 1930s and recent storms. This book was displayed in our school library with other new nonfiction books. I don't read a ton of informational nonfiction, but this one caught my eye. It explains the dust bowl in a way that's very easy to understand, and I think the format of a graphic novel is perfect for the information the author is providing. A quick, very informative read. I learned a lot. Don Brown is amazing. A graphic novel history of the Dust Bowl, focusing on the ecological reasons for the disaster. He uses the actual words of people who wrote about their experiences, and has a comprehensive list of sources at the end. The illustrations are sepia-toned; appropriate for the time and the topic. Wow! Totally surprised by this one. A slice of history presented eloquently and concisely. More than a little terrifying (see bugs and suffocation) and eye opening. I love that Brown focuses on the causes of the disaster, the impact as it happened and the overcoming of it. A cautionary tale of ecological disaster. History teachers should have books like this for students. I had no idea that dust storms still happened in the USA in this century. I also did not know how deadly and massive they could be. This book brings history to light and awakens the reader to the fact that history is still happening! I thought it was really good because I learned some things from it that I didn't know about the dust bowl. It was quite dramatic, but that made it good. I liked the pictures because combined with the words they made you feel the struggle the people went through as if you were going through it too. A fascinating graphic novel about the events leading up to the creation of the Dust Bowl and the effects of all those dust storms so many years later. This book would pair well with The Grapes of Wrath. Appropriate for middle and high school. Don Brown is the award-winning author and illustrator of many picture book biographies. He has been widely praised for his resonant storytelling and his delicate watercolor paintings that evoke the excitement, humor, pain, and joy of lives lived with passion. School Library Journal has called him "a current pac Librarian Note: There is more than one author in the Goodreads database with this name.